The city of Flint, Mich., was originally a trading post in the early part of the 19th century before it became a city in 1855. Jacob Smith, who is believed to be the founder of what is now Flint, was employed by the government to visit the Chippewa tribe and entered upon intimate terms with the Native Americans who settled in the area. Smith was originally a resident of Detroit and after the War of 1812 engaged in trading with the Native Americans in the region including Genesee County. General Cass signed the Saginaw Treaty of 1819, in which the Ottawas, Potawatamies, Wyandots, and Chippewas ceded to the United States all of the territory in southeast Michigan, beginning at "White Rock" on Lake Huron. This allowed Smith to make the Grand Traverse of Flint his permanent trading post. The Indian Trail leading from Detroit to Saginaw crossed the Flint River just above the bridge on Saginaw Street, where there was a fording place. This area was known to the early French traders as the Grand Traverse, or "great crossing." Smith built a log trading post there in 1819. Flint grew into a prosperous village and incorporated in 1855 because of its location as an ideal trade route between Detroit and Saginaw. The 1860 U.S. Census Bureau indicated that Genesee County had a population of 22,498 with the population of Flint at 2,950. Over the next few decades Flint flourished as a center of the Michigan lumber industry. By 1880 Michigan was producing as much lumber as the next three states combined. The Flint rivers played a very important role for the loggers because the lumber was floated to the mills and then to the market. William Crapo Durant and his partner, Dallas Dort, started the Flint Road Cart Co. The name was later changed to the Durant-Dort Carriage Co. and became the largest carriage-making company in Michigan in the late 1800s. As horse-drawn carriages gave way to automobiles Flint grew into a major player in the automobile industry. David Dunbar Buick founded the Buick Motor Co. in 1899, which was later taken over by James H. Whiting, owner of Flint Wagon Works. Whiting brought in Durant to manage Flint's Buick Motor Co. in 1904. In 1908 Durant approached J.P. Morgan for financing and later founded General Motors Co., which soon owned 11 different auto makers and 19 suppliers in 1910. The company, however, lost money and the investors voted to release Durant from his position. Shortly after his removal from GM, Durant met Louis and Arthur Chevrolet in 1911. Durant recognized the mechanical skills of Louis Chevrolet and joined with him to build Chevrolets in Flint and Detroit. Durant switched Chevrolet Co. into a producer that made cars for a mass market while Louis Chevrolet was away in France. Once Louis Chevrolet returned to Flint and discovered this shift he quit the company, leaving it to be run by Durant. Chevrolet Co. prospered and Durant used his profits to buy stock in GM, amassing enough to control the company once again in 1916. Durant then proceeded to merge GM with Chevrolet Co., but was ousted from his position for the second and final time in 1920 by the lenders supporting GM. The size of GM in terms of personnel increased from about 49,000 to 85,000 workers within a decade and GM accounted for 12 percent of the U.S. car market in the early 20th century. Housing was one of the major issues facing Flint at this time, with many sleeping in tents and cardboard shacks. In response, housing was quickly erected on narrow lots, close to the factories that provided employment. Charles Stewart Mott was another individual who played a major role in both GM and the Flint community. Mott established the Weston-Mott Co., which became the largest axle company in the country after relocating to Flint. GM acquired 49 percent of the Weston-Mott company stock in 1908 and the remaining 51 percent was acquired in return for GM stock. The Weston-Mott Co. had reached a value of $3 million in 13 years with Mott serving on the GM board of directors in 1913. Mott also served as the mayor of Flint from 1912-1913 and was reelected again in 1918. The C.S. Mott Foundation was later established in 1926 and would respond to the increasing needs of Flint. In 1935 the Mott Foundation partnered with Flint Community Schools through funding of school-based educational and recreational activities. Superintendent Frank Manley convinced Mott to fund an after-hours school program. This grant led to a partnership with the Flint board of education that spanned several decades, where the foundation concentrated its grants on programs in partnership with the board until the late 1960s. Flint's population skyrocketed from 13,103 in 1900 to 156,492 in 1930 according to the U.S. Census Bureau, partly because of the booming automotive industry in the area. The year 1937 marked the first major strike in the U.S. auto industry with the United Auto Workers organizing a sit-in strike in several plants owned by GM. In 1936 the average auto worker took home about $900, while $1600 was the minimum on which a family of four could live according to a standard of living report by the U.S. government. Hundreds of deaths in Michigan took place in 1936 in what was thought to be a result of a heat wave combined with difficult working conditions. GM workers started their sit-down strike, gaining control of Fisher Body Plant Number One and most notably Chevy Plant Number Four, the largest plant owned by GM. By remaining inside the plant strikers were protected from violence, weather, and replacement by other workers. After 44 days GM President Alfred P. Sloan announced a $25 million wage increase to workers and recognition of the union. Within a year, membership in the United Auto Workers grew from 30,000 to 500,000 and wages for autoworkers increased by as much as 300 percent. The strike marked the beginning of decades of intense union activity. The city's population peaked in 1960 at almost 200,000, making it the second largest city in the state. Flint's master plan in the 1960s projected that the city would grow to a population of 250,000. 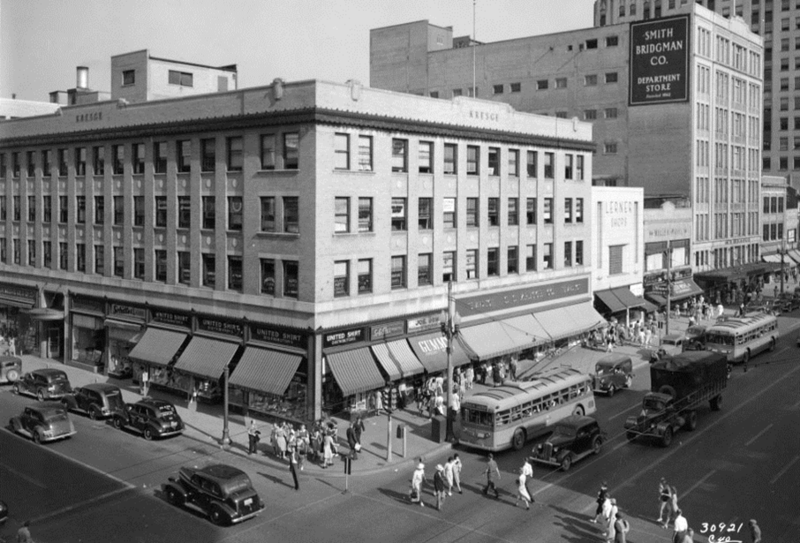 Flint's prosperity and influence is said to have peaked in the 1950s, culminated with the establishment of many local institutions. One of the city's chief commercial and artistic draws is the Flint Cultural Center, which is a campus of institutes that include the Sloan Museum, Buick Gallery & Research Center, Flint Institute of Arts, Robert T. Longway Planetarium, The Whiting, Flint Youth Theatre, and the Flint Institute of Music. Charles Mott donated land to establish Mott Community College and he continued to support the community's growth through donations and grants. The University of Michigan-Flint was also established in 1956. GM's U.S. market share reached 54 percent in 1954 with the company producing its 50 millionth car. The company's U.S. employment peaked at 618,365 in 1979, making it the largest private employer in the country. Because of internationalization in the auto industry and increasing popularity of imported cars, GM closed several plants in Flint. Production was outsourced to other countries, causing tens of thousands of U.S. workers to become unemployed. As many as 80,000 employees were hired by GM in the Flint area in the 1960s, while fewer than 33,000 remained by 1998. In 2008 fewer than 7,100 salaried employees were in the area. By 2002 Flint had accrued $30 million in debt and the state of Michigan appointed an emergency financial manager, Ed Kurtz. At its peak, Flint contained over 190,000 people in the 1970s. In 30 years 124,000 people lived in the area while 99,000 remained according to the 2013 U.S. Census Bureau. Flint's crime statistics, per 100,000 people, included 62 murders, 106 forcible rapes, and 662 robberies according to an FBI statistics report conducted in 2012. Violent crimes reached a total of 2,729 and the U.S. Census Bureau concluded that the poverty rate is currently over 40 percent. Because of the overproduction of homes during Flint's peak period many are now left vacant. Numerous schools have been closed down, including eleven elementary schools and one high school in 2011. In an effort to change the community, Flint has taken steps similar to Detroit in renovating its downtown. The University of Michigan-Flint recently opened its first dorm downtown, the Durant Hotel has been renovated to make way for more commercial space and apartments, and over 1100 vacant homes have been torn down. Other renovation projects are currently underway. The most recent development in the city involves the lead water crisis. Flint was originally connected to the Detroit water system but began drawing water from the Flint River in April 2014 as a way to save money. The connection was supposed to be temporary until a new supply line to Lake Huron was built and the decision was made during a financial state of emergency. After testing was performed by researchers from Virginia Tech the Flint River was found to be highly corrosive. The water started eroding the iron water mains, causing the water to turn brown. About half of the service lines to the homes in Flint are made of lead. Because the Department of Environmental Quality didn’t treat the Flint River with an anti-corrosive agent lead from the service lines began to seep into the water supply. When tested in the summer of 2015 the water in Flint contained 27 parts per billion with the highest level found in Virginia Tech’s sample at 158 parts per billion. In the spring of 2015 more than half of the readings from Virginia Tech's study came in at around 1,000 ppb and the highest level found was at 13,000 ppb. A state of emergency was issued by Michigan Gov. Rick Snyder with the National Guard handing out bottled water to the citizens of Flint. Snyder also sent a letter to U.S. President Barack Obama asking for federal help in dealing with the crisis. The president responded by declaring the situation in Flint a federal emergency, allocating $80 million to help in the aid for the water crisis. Despite returning to Detroit water there are concerns that the pipes are damaged and will continue to leech lead into the water supply. Snyder reports that over the long term replacing services lines could cost $54 million. Snyder also said that 90 days of clean drinking water could cost $10.3 million and home filters, filter cartridges, and testing kits could cost $31 million in a year.